Hampson Hughes Solicitors television advertising debut has been recognised by the MPA and shortlisted in the Media Agency Collaboration category. Manchester’s MPA organisation is, for the first time, about to play host to a celebration of creativity and innovation with the newly launched ‘MPA Awards’. Working to sustain and embellish the existing media community, the not-for-profit MPA now contains over 1600 members, all of which are eligible to compete in the Awards competition to be held on the 12th September. Media Agency Group are very proud to announce their shortlisted position in the collection of Awards finalists, placed under the category of Media Agencies Collaboration for their comprehensive management of Hampson Hughes Solicitors’ first ever television advertising campaign. Media Agency Group united with their fellow Mancunians at Global Creative Team and Create Group, concluding with a pair of 30-second television spots. Launching across the North West branch of ITV in May 2013, the campaign overhauled the stereotypical despondency of a personal injury advert by fashioning an adaptation of Herman’s Hermits’ 1965 hit ‘I’m Into Something Good’. 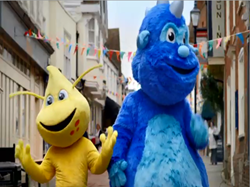 Two fictional characters were conceived to focus on the positive outcomes available from Hampson Hughes’ Personal Injury service, in the form of ill-fated Harvey the furry blue dinosaur and his endearing yellow alien friend Archie.